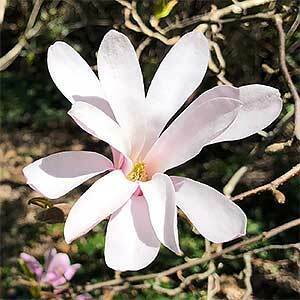 A deciduous magnolia with fragrant flowers, Magnolia loebneri ‘Leonard Messel’ is a Magnolia stellata ‘Rosea’ hybrid. It is later flowering than many which makes it more tolerant of frosts. The star shaped flowers appear on bare stems from late winter to spring depending on the climate. A humus rich soil with some moisture is required for good growth, as is a position with at least good morning sun. A position protect from strong wind is recommended. Good drainage is important and mulching around the plant to retain some moisture through summer and maintain a cool root run is important. Before planting dig a good amount of aged compost and some cow manure through he soil. Add a little blood and bone as well and water in with a liquid seaweed fertiliser. Generally not required except for removal any dead or damaged growth. Height – To around 6 metres over time. Foliage – Deep green, new foliage has a coppery tone.. Flowers – White infused with pink and star shaped.